Directors Nathalie Lemieux (left) and Suzan Payne (right) and their feathered friends. 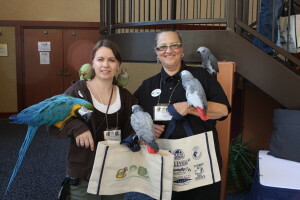 The Canadian Parrot Conference is a not-for-profit event organized by a group of volunteers. There are 2 directors and a committee that work with the directors to keep the event run smoothly. Each year other volunteers take an active part helping out at the event.